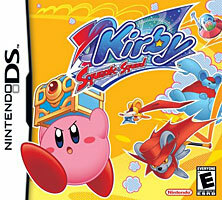 The floating, jumping, and battling of a classic Kirby video game with touch screen access to upgradeable abilities and recovery items. Burn trees and grasses with the Fire Ability or freeze water with the Ice Ability as you hunt down treasure chests in eight worlds. Three multiplayer mini-games for up to four players are accessible either via DS Download Play or multicard play. Mix and match abilities that Kirby copies by using the stylus to drag them together inside Kirby's belly.